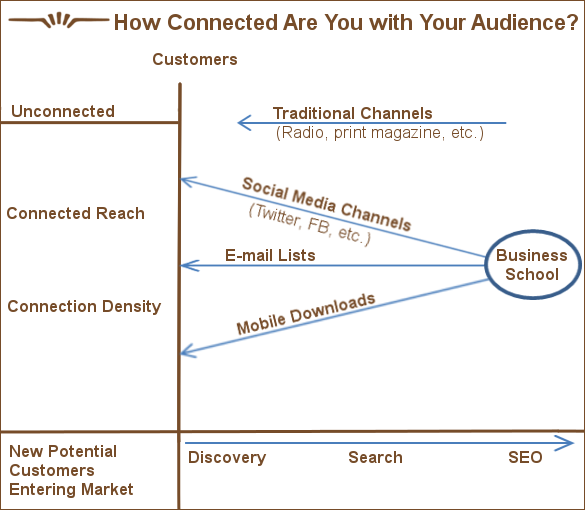 The emergence and maturity of the internet, social media and mobile has provided a means for business schools to connect, directly, with their audiences. This is a fundamental shift in communications; prior to the internet access to audiences was was limited to traditional mass media and the mail service. We have three broad channels that can provide direct connection; social media platforms, e-mail lists and mobile app downloads. These channels can be used to deliver tailored, real-time content directly to our constituents. This is not new news. But given that we do now have direct access to our audiences, we should investigate how connected we are to our audiences. Connected Reach: The percentage of prospective applicants to whom you are directly connected. What percentage of your applicant pool is directly connected to your content marketing efforts? What is your connected reach? The number of individuals that are engaged via social media, e-mail lists or a mobile app download, versus the total number of individuals who have shown interest in your school. Understanding this number, and making efforts to increase this number versus those that are not connected, will provide more control over appropriate messaging to your audiences. 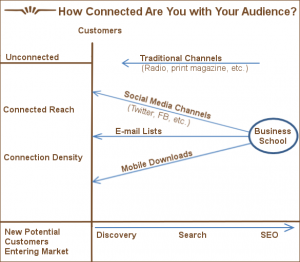 Connection Density: Through how many channels are your prospects following you? Similarly, many of those connected to your content marketing efforts will be connected via multiple touch points. A candidate may follow your twitter feed, as well as subscribe to your e-mail list for prospective applicants. Another candidate may have liked your Facebook page, followed you on Twitter and downloaded your mobile app. Each candidate’s various direct connections to your content efforts can equate to that candidate’s connection density. The average connection density of your applicant pool, or at least of those who are connected, can be an interesting data point to explore as you develop a robust content marketing strategy. This should help inform how important it might be to offer unique content by channel, versus similar content across all channels. These types of calculations, connected reach, and connection density, are new ideas, simply because these new channels are really only now maturing and becoming the de facto channels of communications. The problem now becomes, how best to calculate the appropriate numbers, as well as increase those numbers. We will explore both these issues in our next edition of Engage.